The next launch attempt will be Thursday, April 11. SpaceX's Falcon Heavy rocket, topped with the Arabsat-6A communications satellite, sits on the launch pad on April 10, 2019. This Falcon Heavy, SpaceX's first to feature the company's upgraded Falcon 9 side boosters, is carrying the commercial communications satellite Arabsat-6A for the Saudi Arabian company Arabsat. It was scheduled to launch from Launch Complex 39A of NASA's Kennedy Space Center in Florida at 8:36 p.m. EDT (0036 April 11 GMT) when SpaceX called off the flight. "Standing down from today's Falcon Heavy launch attempt; next opportunity is tomorrow, April 11," SpaceX representatives wrote in a Twitter status update today. 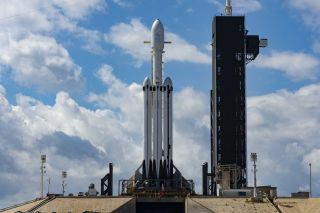 A Thursday launch for Falcon Heavy would occur at 6:35 p.m. EDT (2235 GMT), with weather forecasts currently predicting a 90% chance of good weather, according to the 45th Weather Squadron at Cape Canaveral Air Force Station. Those same forecasts, however, also predicted an 80% chance of good conditions for today's launch try, yet SpaceX repeatedly pushed its launch time deeper into a launch window that opened at 6:35 p.m. EDT (2235 GMT) to the weather. Earlier, SpaceX founder and CEO Elon Musk cited excessive winds for the delay. "Upper atmospheric wind shear is very high," Musk wrote less than an hour before SpaceX announced the delay. "Will have to postpone launch unless weather proves soon." The launch of Arabsat-6A on a Falcon Heavy will mark the first commercial flight of the rocket, the most powerful booster in use today, and the second mission for the megarocket following a successful test flight in February 2018. During that test flight, which launched Musk's cherry red Tesla Roadster into deep space, Falcon Heavy's twin side boosters returned to Earth to make side-by-side landings on SpaceX pads at Cape Canaveral Air Force Station. SpaceX hopes to repeat that dual landing with the Arabsat-6A, and then do one better by landing the rocket's massive center core stage on an offshore droneship in the Atlantic Ocean. During the 2018 test flight, the center core stage missed its landing when two of the engines ran out of igniter fuel during a maneuver. SpaceX had initially hoped to launch Falcon Heavy's Arabsat-6A mission by the end of 2018, but ultimately pushed it into 2019. The company also plans to use the megarocket to launch more than two dozen satellites for the U.S. military as part of the Space Test Program-2 launch. The U.S. Air Force has also awarded SpaceX a $130 million contract to launch the classified Air Force Space Command-52 satellite (AFSPC-52) late in the 2020 fiscal year. You can watch the Falcon Heavy launch Thursday here and on Space.com's homepage, courtesy of SpaceX, beginning about 20 minutes before liftoff. You can also watch the launch directly from SpaceX's website here.